Just some random thoughts as I get over the Bank Holiday weekend. 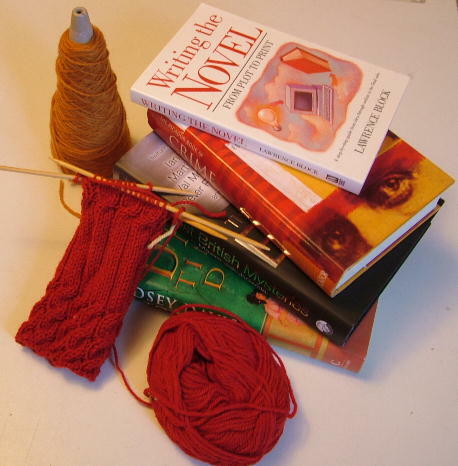 The weather for once was just wonderful all over the weekend, so even though I did 2 days work in the shop I still managed to fit in a few car boot sales, a few books and some knitting. I finished the Lee Child book The Hard Way and enjoyed it more than I expected. I then read Illusion by Daniel Boyle. Can't say that I enjoyed that, found it very irritating. Reviews of both of these will be wending their way to Karen at Eurocrime this week. I'm now reading A Fine Dark Line by Joe R Lansdale. Couldn't resist it any longer (I thought I did well to fit in the Daniel Boyle first - showing remarkable retraint!). I've been knitting a lovely chunky cardigan - Sonnet from Knitty.com. I'm knitting it in chocolate brown pure wool. The great thing about this pattern is that it is easily adjustable (designed that way!) so you can knit it in any yarn with any gauge. It's a bit of a dull knit though, even if it does knit up quickly in the chunky yarn. And of course the weaher has turned warm so by the time I'm finished it, it will be too heavy to wear. Anyway it is entirely the wrong colour for Project Spectrum so I shall be casting on the bright yellow and green socks as soon as I've finished blogging. There was a fantastic program on TV last night about Jackie magazine - great nostalgic value for those of us who were teenagers in the seventies. The Evilpixie watched it with amused fascination - difficult for her to image life without iPods, mobile phones, computers etc. Tonight is the final part of Life on Mars. I've enjoyed this series immensely, but I think they are right to end it now. I understand there will be a spin off starring the wonderful Philip Glenister, set in London. Hopefully it will live up to the high standard of writing on the original series. Anyway, must go - socks to cast on! I too watch the program about jackie mag, with my husband! still it brought back some memory!see you in a few weeks as i'm off to see my mum in yorkshire!